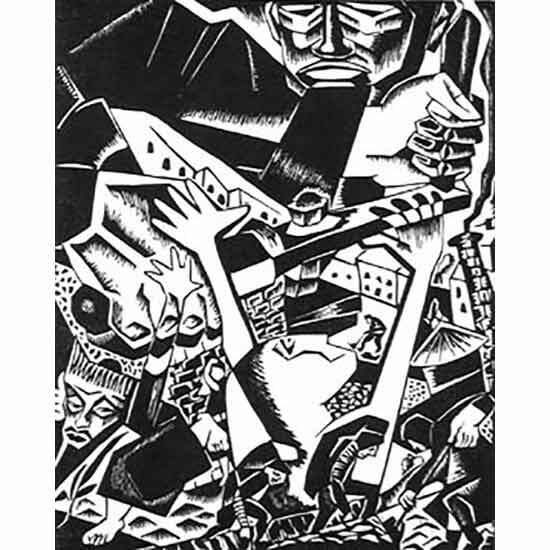 This portfolio of woodcut prints was created by a group of progressive Jewish artists from Chicago in support of Biro-Bidjan, an autonomous Jewish region in Siberia. In 1934, a Jewish autonomous region was established in Biro-Bidjan (sometimes spelled Birobidzhan), Siberia. This Jewish region emerged from a Soviet policy that encouraged each ethnic group to contribute to the building of socialism by settling its own territory (or oblast) and developing its own language and culture. Yiddish was declared the official language of the Jewish Oblast and a proletariat secular culture was bolstered. From 1934 to 1937, the area boasted Yiddish newspapers, schools, a library, and a theater. An American Biro-Bidjan Committee, whose officers included Albert Einstein, raised funds to relocate families to the region particularly as a haven from Nazism. Julius Rosenwald, the president of Sears and founder of the Museum of Science and Industry, contributed more than $2 million to the cause. 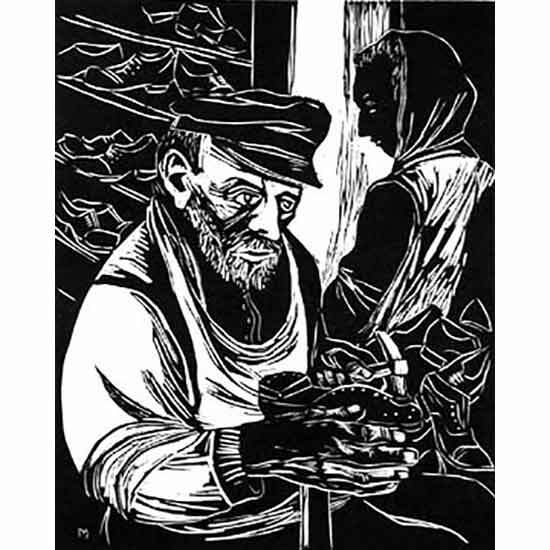 In 1937, a group of progressive Jewish artists from Chicago created a portfolio of prints in support of Biro-Bidjan. 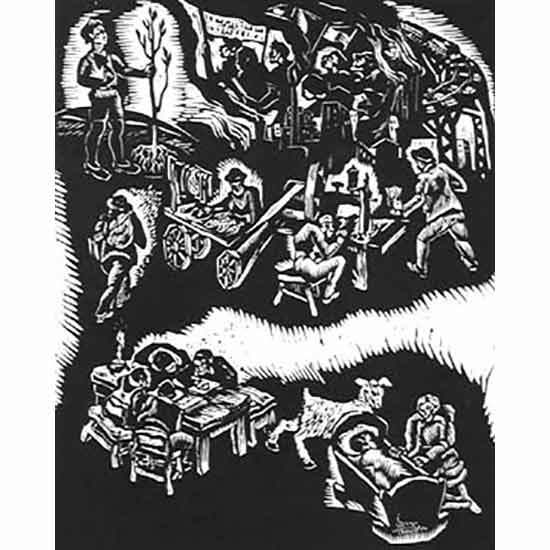 In the introduction to the portfolio, written in Yiddish and English, the artists expressed that their work emerged from a past rooted in age-old suffering but is energized by a new cultural force that aspires for a better life and a more understanding world. 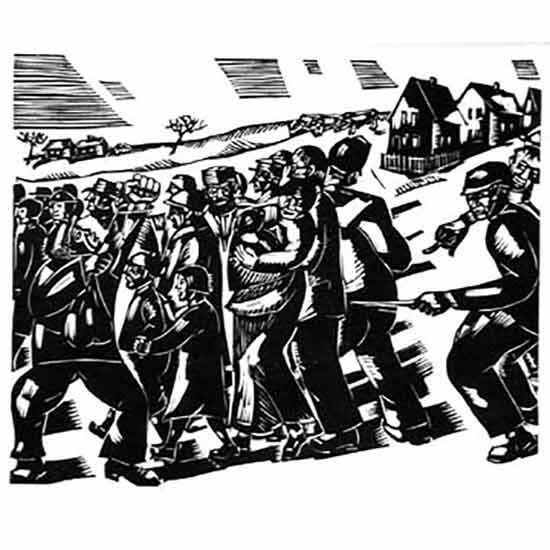 As such, some of the woodcuts convey hardship, both in Depression-era America and in Europe, while others express optimism and hope for the future. 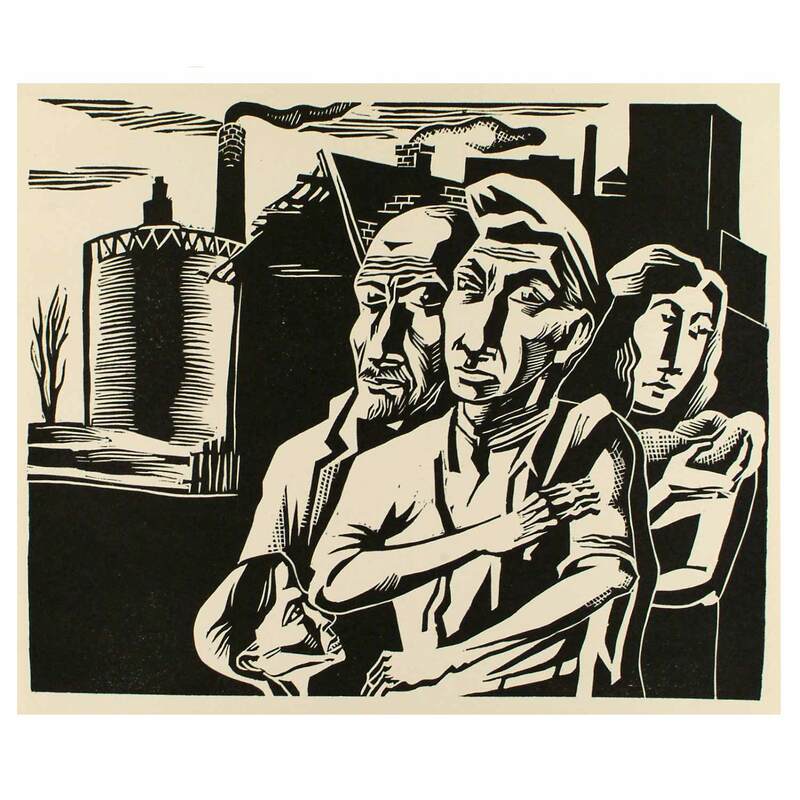 This scene by Mitchell Siporin (1910-1976) depicts a multi-generational working class family against the backdrop of a gritty industrial urban landscape. 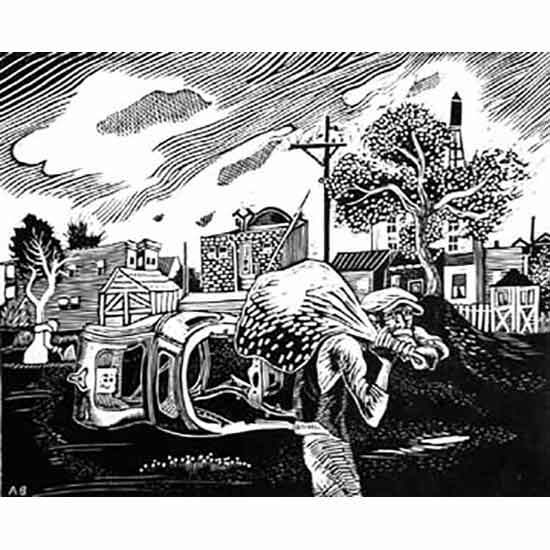 The woodcut medium creates a stark contrast between the illuminated family members and the dark smokestacks and their plumes. In this work, Topchevsky reacts to contemporary events occurring in Nazi Germany. Starting in 1933, German Jews were gradually stripped of their rights and endured increasing economic and social restrictions. 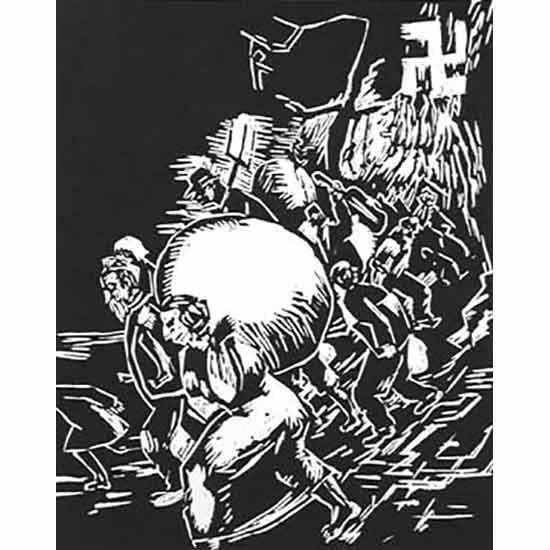 This work documents the efforts of many Jews to escape Nazi Germany, with Biro-Bidjan, presumably, being offered as a potential destination. Persecution is highly reminiscent of the brutal and satiric graphics of the German Expressionist George Grosz. Here, the subjects are Eastern European victims of pogroms and expulsions, heading towards safety and freedom in America, the Land of Israel, or Biro-Bidjan. This work shows an elderly man carrying his belongings in a sack, against a backdrop of debris. The title indicates that the scene takes place on Chicago’s West Side, where the majority of Chicago Jews lived in 1937. While the subject matter is typical for Depression-era artwork, the title gives it particular Jewish resonance. 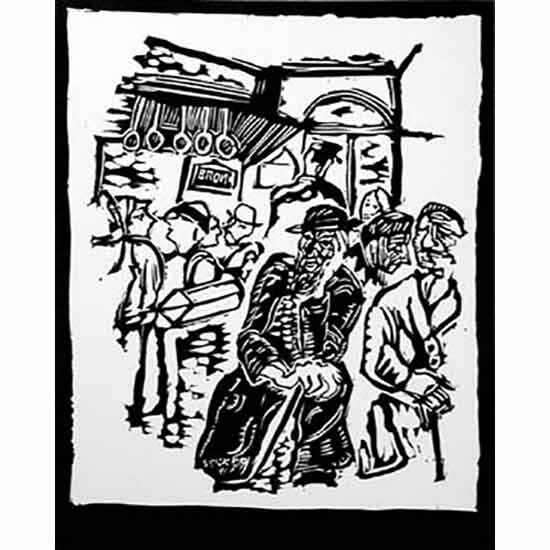 Bronx Express is the title of a Yiddish Play written by Osip Dymov (Yosef Perlman) that deals with the challenges faced by Russian Jewish immigrants in America. Bekker’s work is based on the prologue to the play: Subway car on the Bronx Express line. Afternoon rush-hour of a hot day in August. The car is packed with people: men, women, and children, old and young. Some sit, some stand. Many read newspapers. Brod’s patterned and decorative work reflects her background as an influential textile designer, and also shows the influence of the Art Nouveau style. 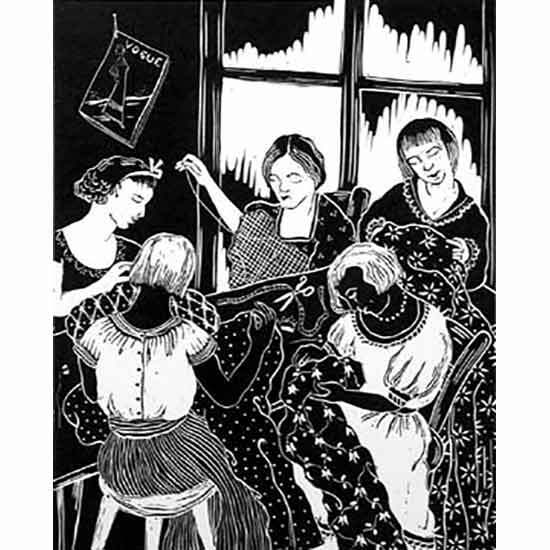 Though the women are pictured in what appears to be a crowded sweatshop, there is an air of harmony and camaraderie, reinforced by the Vogue magazine hanging on the wall. This complex scene blends the experience of the Jewish slaves in Egypt with that of workers during the Great Depression. The large illuminated figure with extended arms is reminiscent of Pablo Picasso’s Guernica, a powerful and highly influential treatment of human suffering during the Spanish Civil War, also completed in 1937. 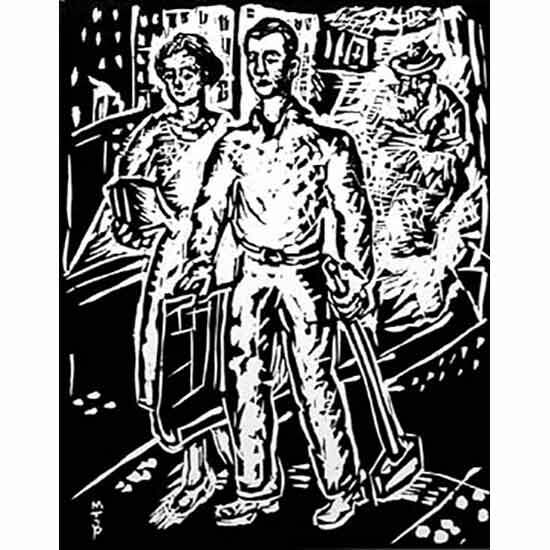 No Business expresses the universal theme of poverty and despair during the Great Depression, and for immigrants in particular, the shattering of the American Dream. 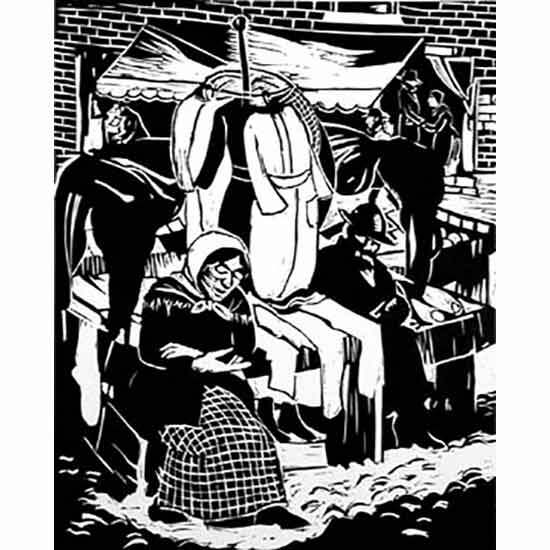 The scene takes place in the bazaar-like setting of the Maxwell Street Market, first point of settlement for many Chicago Jews. 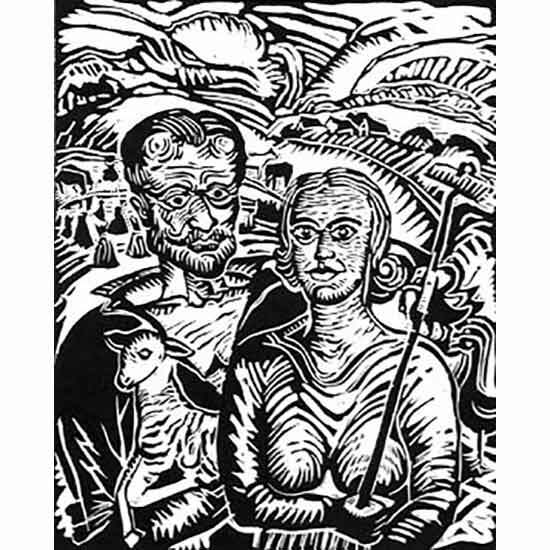 Milk and Honey is Weiner’s interpretation of Grant Wood’s classic American Gothic. 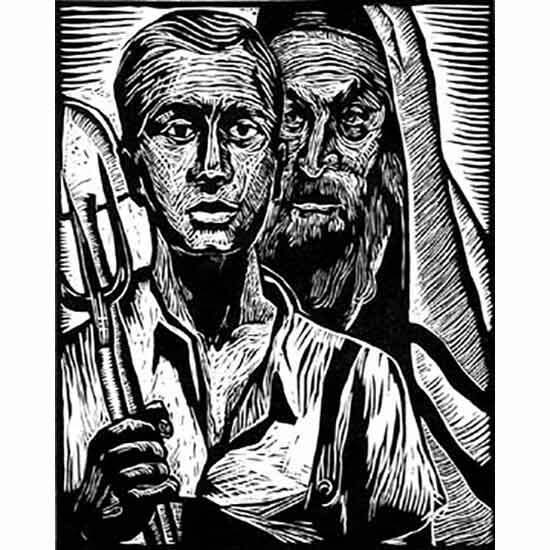 In 1930, American Gothic was exhibited in the Art Institute’s annual juried exhibition and won, becoming a model for realist art during the Depression. Weiner’s work also takes place in a rural landscape, only here, the woman holds the rake instead of the man, signifying labor equality in the new utopian world order. 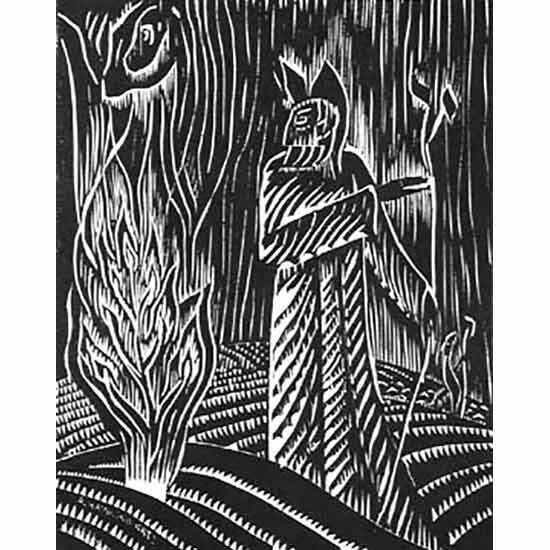 Moses and the Burning Bush is used here as a metaphor for the survival of the Jewish people. Hebrew letters appear throughout the composition, as Katz explores the artistic possibilities inherent in the characters of the Hebrew alphabet. Raisins and Almonds is the title of a Yiddish poem and lullaby, written by Abraham Goldfaden in 1880. In this cycle, Geller shows a baby in a cradle, who grows into a Yeshiva student, then goes to work in order to emigrate, arrives in Chicago with its elevated train tracks, marches in demonstrations, and ultimately achieves a kind of renewal and transcendence as he stands grasping a sapling. In New Hope, Rosenberg puts the image of the “Old Jew” in direct opposition to the “New Jew.” The “Old Jew” is an elderly bearded figure with a prayer shawl over his head. The “New Jew” is clean-shaven, wears work clothes, and holds a pitchfork. He stares at the viewer with a penetrating gaze, full of expectation. Birobidzhan is a town and the administrative center of the Jewish Autonomous Oblast, Russia, located on the Trans-Siberian Railway, close to the border with China. Dimensions: 8 x 9 1/2 in.